Experience: at least 05 (five) years in relevant field. Age: Not exceeding 40 years as on 31-12-2016. · Review, Monitor and manage operation of Capital Market Investments of Banks. · Conduct investment research analysis, portfolio management and develop & executive efficient strategy. · Analyze financial statements, trends, technical indicators of listed companies. · Develop, Maintain, update market information database for all listed companies. · Efficiently positioning the institutional and retail investors to procure the right portfolio. · Keeping up to date with political and economic development that may affect the financial markets. · Coordinating with high level “advisory Committee” of our Bank regarding share management. · Any other responsibility assigned by the Management. · Candidate should have research experience in stock Brokerage/ Merchant Bank. · Mid-level job experience in investment management and Capital market operations with reputed financial institutions. · Conversant with relevant rules & regulations. Academic Qualification: MBA major in Finance from a reputed University having no 3rd division/class. Experience: At least 02(two) years in relevant field. Age: Not exceeding 35 years as on 31-12-2016. · Finding new investment opportunities. · Examining, record keeping and analyzing our BO account. · Producing reports for the Board, Management and stakeholders. · Any other responsibilities assigned by the Management. 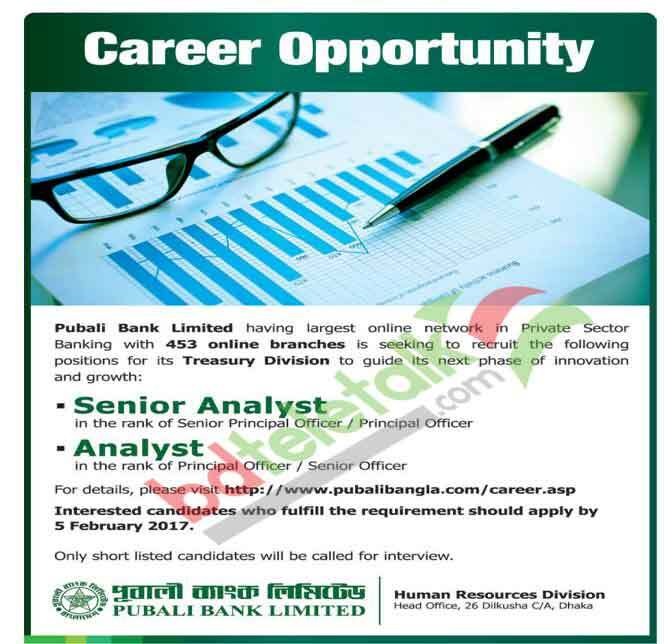 · Interested candidates who fulfill the requirements shall apply with attested photocopies of all academic & professional experience certificates; 03 (three) attested recent passport size coloured photographs addressed to the General Manager, Pubali Bank Limited, Human Resources Division, Head Office, 26 Dilkusha C/A, Dhaka –1000 by 05 February 2017. · The name of the post applied for should be clearly written on the envelope and in the application. · Only short listed candidates will be called for interview. · No TA/ DA will be applicable for this purpose.